Innovation is what keeps security companies everywhere ahead of criminals. First, it was the walkie-talkie and then the more advanced push to talk technology. Today it is all about the adaptation of existing digital technology to suit the security industry and improve the services provided to clients. 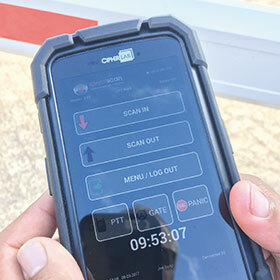 Blending innovation and technology, OnGuard Mobi is the next step in tour guard technology that can assist any security company in improving its patrol services. The product is a security guard patrol system that is designed to be built into a touch screen mobile phone. The device eliminates the need to have paperwork while it also makes the collection of data a tamper-proof process. With its smartphone technology, these systems are designed to provide real-time communication between the guard and the security company, ensuring that the company is always aware of the patrol route the guard is taking while knowing they can easily get in touch with the tour guard on duty. One of the most important features of OnGuard Mobi is that it improves the reaction times when an incident occurs. As it also improves accountability and reporting, it becomes the ideal security system to have. With this device, guards can produce highly accurate records of incidents and they can use the device to take photographs which can be included in such reports. • Access control: OnGuard Mobi has built-in access control system capability. With this system, there will be more control over who will enter the property. OnGuard Mobi can be paired with numerous operating systems by using a QR code and the system can be used along with existing security patrol systems. Using a variety of security options, along with OnGuard Mobi, can improve the services that you are providing for your clients.